Matt Kramer, author of the classic Making Sense series of wine books and longtime Wine Spectator columnist, is trying hard to make sense of Italian wine. This is a challenging endeavor, and it takes an expert writer to make the reader understand the differences between similar-sounding wines such as Barolo, Barbaresco, Barbera d’Alba, Barbera d’Asti, and Bardolino. 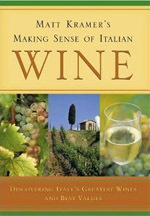 Matt Kramer does an excellent job – his book is essentially a buying guide for newcomers to Italian wine. Making Sense of Italian Wine mainly describes 40 different Italian wines, providing for each wine, information about grape varieties, history, noteworthy producers, and food pairing suggestions based on local traditions. At the end of each chapter, Matt Kramer answers the crucial question “Is this wine worth searching”, as however charming Italian wine can be, they are not all worth running around to locate. He also points out similar wines that sometimes cost a fraction of their famous brothers and sisters. This wine book also includes extra chapters providing deep insight into Italian culture and philosophy and their influence on wine-making. Having lived in Italy, Matt Kramer has a deep understanding of the subject and enriches its descriptions with great anecdotes.